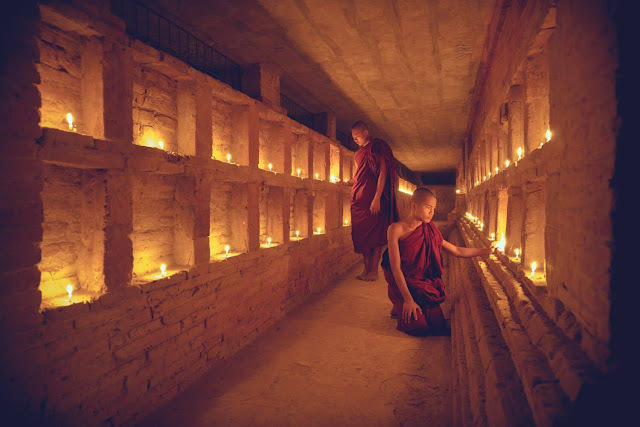 Bagan is the old capital city of Myanmar with more than 2000 temples built close to each others which is similar to Angkor, the air in the city is filled with antiquity, which gives a feeling of sacred and peaceful times, the old temples covered in the mist are incredibly mysterious. 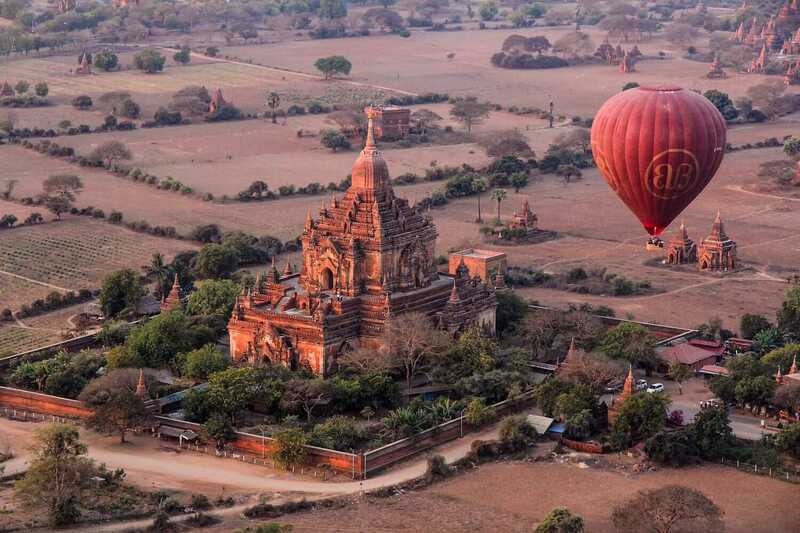 Especially in Bagan, you can take many beautiful photos from high places. It takes about 10 hours to travel from Yagon to Bagan. The bumpy road slows us down a little bit but it also gave us enough time to mentally recovered and be ready to watch sunrise at 6.30 am from the temple of Shwe San Daw (the map of Bagan is available in motels) right after we get off the vehicle. 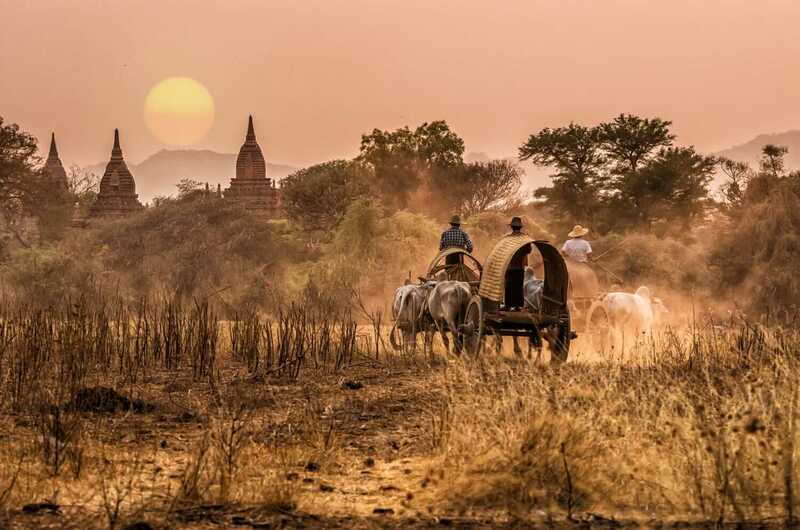 In Bagan there are many transport options for you to choose such as wagons, bicycle, electric bike, or a cab. The price of transportation is negotiable with the service providers, or you can ask the motel receptionist for most reasonable prices. If money is not a problem with you then you can preorder an air balloon tour for sight-seeing at the cost of $, the views will completely amaze you. There are not many unique dishes in Bagan, you should carry your own food such as sausages, hams, canned fish, or cheese..etc if possible. You can stay at the Golden Myanmar Motel around Old Bagan (Most motels in New Bagan are expensive). The motel is close to a bus stop, it provides free wireless connection , hot water, air conditioner, and it is very quiet , the employees are able to speak English very good and the price for a double room is about $30, there is a groceries store just 3 blocks away from the motel which provides a wide range of food and drink, and a free breakfast. Note: Be careful not to be overly charged by cab drivers who are willing to take 10k kyat from you for just a 5 minute drive to your motel. 1. The old capital city of Old Bagan, where there are many temples that would take us more than 2 days to fully visit all of which. Due to our lack of time, we had to hire a cab for 45k kyat from 8 a.m to 7 p.m, which is better because the driver is familiar with where to go first and from where we are able to watch sunrise and sunset, However some places charge visitors $15 for an entrance ticket. New Bagan is not an attractive place to visit because there are just motels and some traditional villages such as kite-painting, drawing..
2. Popa mountain which is 50km away from Old Bagan, suitable for a half-day sight-seeing experience (Because in the following evening we would be travelling to Inle) the price for a cab is also 45k Kyat. This is a temple on a high mountain, the cab will take you close to the mountain peak, and you have to climb about 700 steps of a stone ladder to get to the top of the temple, during your tour you will meet with countless mischievous mountain monkeys who are always staring at you and ready to receive nuts when given (There is a staff team who takes care of it). The cab driver will take you to a native residence who is specialized in making Vodka and jams, you will be given a chance to try and to spray the thanakhan powder upon your face, which is a really interesting experience. For some good reasons, Bagan is chosen as one of top places to visit in Myanmar, even luxury holidays such as river cruises on Irrawaddy River. Check out a best river cruise with Sanctuary Ananda at https://luxurymyanmarrivercruises.com/cruise/sanctuary-ananda/ or contact us to get best offer!